Born in Vinton, Louisiana, Brown was raised in Orange, Texas. His professional musical career began in 1945, playing drums in San Antonio. He was nicknamed "Gatemouth" for his deep voice. He received note, and his fame took off, during a 1947 concert by T-Bone Walker in a Houston nightclub. When Walker became ill, Brown took up his guitar and played "Gatemouth Boogie," to the delight of the audience. He soon played guitar and other instruments, living primarily in Texas. In the 1960s he moved to Nashville to participate in a syndicated R & B television show, and while he was there recorded several country singles. He struck up a friendship with Roy Clark and made several appearances on the television show Hee Haw. By the late 60s he had decided to leave the music business and he moved to New Mexico and became a deputy sheriff. However, in the early 1970s several countries in Europe had developed an appreciation for American roots music, especially blues, and Brown was a popular and well-respected artist there. He toured Europe twelve times, beginning in 1971 and continuing throughout the 1970s. He also became an official ambassador for American music, and participated in several tours sponsored by the U.S. State Department, including an extensive tour of Eastern Africa. He moved to New Orleans in the late 1970s. In September 2004, Brown was diagnosed with lung cancer. Already suffering from emphysema and heart disease, he and his doctors decided to forgo treatment. His home in Slidell, Louisiana, was destroyed by Hurricane Katrina in 2005, and he was evacuated to his childhood home town of Orange, Texas, where he died September 10 at his brother's home at the age of 81. During his career, he played a wide variety of guitars, including Gibson L-5s and Fender Telecasters, but his trademark guitar was a mid-60s 'non-reverse' Gibson Firebird, customized with an embossed-leather cover featuring a rose and "Gatemouth," amongst other designs. 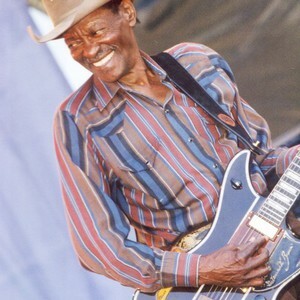 His guitar style influenced many other blues guitarists such as Albert Collins, Guitar Slim, J.J.Cale, and Johnny "Guitar" Watson. Frank Zappa named Brown as his all-time favorite guitarist. He is also considered as one of the first guitarists to use a capo in his guitar technique. Although well-known in the American South and Southwest, Brown had trouble reaching a national audience, and recorded for several different small labels in the early part of his career. His most recent album, Timeless, was released in late 2004.